BendPak's HDS-Truck Series four-post lifts are a whole new breed of rugged. They're newly engineered heavy-duty truck lifts that make light work out of heavy lifting. They work better, are built to last, and feature upgrades that increase safety, durability and productivity. The HDS-18, HDS-27, and extended length HDS-27X four-post models provide a generous 18,000 and 27,000-lb. lifting capacity and feature extra-wide runways to accommodate a wide variety of vehicles configurations. BendPak's HDS-Truck Series lifts feature four stainless-steel lifting cables that provide a great balance between abrasion resistance and fatigue. 12" x 12" base plates provide a solid foundation. Optional rolling jacks make a great addition to increase service capacity. Rolling jacks are used to raise the front or rear portion of a vehicle off the runways allowing operators to perform efficient wheel and break service. A pair of jacks allows the entire vehicle to elevated. Each jack has telescoping arms and frame contact pads that can be extended over the runways and positioned under vehicle lifting points. Each jack features three safety-lock positions and stackable truck and van adapters for increased lifting height and better access to frame contact points on high ground-clearance vehicles. The jacks come equipped with a commercial grade air-hydraulic pump. Lock Spacing Every 6" / 152 mm. Standard Motor (***) 220 VAC / 60 Hz. 1Ph. * This dimension may be limited with the addition of rolling jacks. See rolling jack specifications on separate page. 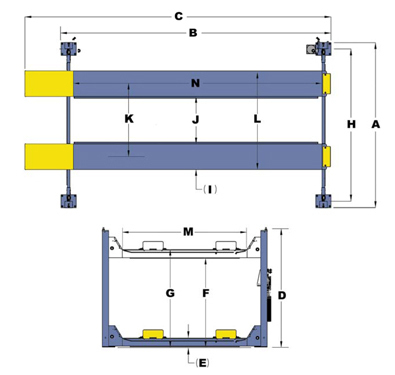 Note - Not all BendPak lift models meet the standards as prescribed by ANSI/ALI ALCTV (Current Edition) or ANSI/UL 201. Consult www.autolift.org for a complete list.